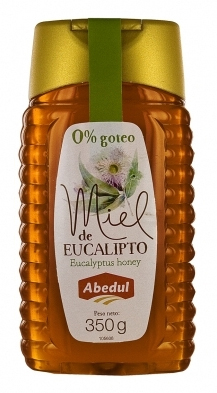 Abedul Eucalyptus Honey squezeer 0% 350 g.
Amber in colour. With a damp timber aroma, very intense and persistent. Sweet taste with slight sour notes. Traditionally used for improving breathing problems. (*) At present, current legislation prohibits attributing properties that are not supported by sufficient evidence or accredited scientific techniques and expressly recognized by the Health Administration.